I love peanut butter. It's a staple in my household. There are usually at least 2 open containers at once, as we seriously eat that much. I have a roommate who is a health nut, so he puts peanut butter in smoothies, shakes, protein drinks, veggies, wraps...you name it - he's probably done it. Seeing as how peanut butter is an excellent source of protein, he's on the right track! I've gotten him hooked on Krema Products. Krema is the oldest peanut butter company in the country, which tells you they know their stuff. They only use #1 Runner-Split peanuts from Georgia when making their wonderful peanut butter. Additionally, all their peanut butter is gluten-free! In fact, the only ingredient in their peanut butter is PEANUTS. You can't get any healthier than that! There are a few questions you might ask when purchasing a Krema Product. One would be "Why is my peanut butter runny?" The answer is simple. "Peanuts vary in oil content. Because we do not add anything to our peanut butter, the texture is a function of the oil content in the peanuts and the type of grind used. Some lots of peanuts may have greater oil levels and therefore some production runs may be runnier than others. We intentionally grind our peanut butter very fine to make the peanut butter creamy so that when stored in the refrigerator to retard the oil separation it does not become too hard to spread. You can regulate to some extent the creaminess of the peanut butter by pouring off excess oil and then adding it back as you use the jar. Store the peanut oil in the refrigerator." Another question might be, "Why is their oil on top of my peanut butter?" "Our peanut butter is natural. This means that we do not add any hydrogenated oils to 'stabilize' the peanut butter and prevent the natural oil separation that occurs when the peanuts are ground. Therefore, over time, as the jar of peanut butter sits the oil from the ground peanuts will separate and rise to the top of the jar. This oil is pure peanut oil. Refrigerating slows this separation. Generally, the longer the jar sits, the more oil will be on the top." 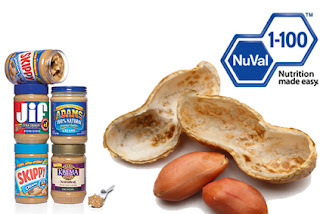 Krema Products distributes two brands of peanut butter - Krema and Crazy Richard's. The only difference between the two is that Krema is sold in the Midwest while Crazy Richard's is sold on the East Coast. I'm sure you've heard of the NuVal System, right? In case you haven't, The NuVal System is a summary of the overall nutritional value of grocery store products on a scale from 1 to 100. The higher the score, the better. How did Krema Products score? Building a case for Natural Foods! Krema Products have been featured on The Today Show & Shine by Yahoo!. If you'd like more information on Krema Products, it is available to you in a variety of ways. You can watch the Interactive Presentation, read their Nutrition Facts or watch a video on the Krema Process. You could view their Recipes, read their Blog or News Feed. handy Where To Buy feature or Order Online!